News from the architecture and interior design industries — BOSTUDIO ARCHITECTURE, P.C. Cara Greenberg does not disappoint with her insightful write-up about our most recent project. A great feature by Dan Howarth for Dezeen. A fantastic article featuring our latest completed project - the 60 White Street condominiums - was featured on ArchDaily. We are very glad that this thoughtfully designed eco-friendly building is getting recognized. Our studio exhibited alongside other Brooklyn architecture firms as part of the AIA Brooklyn Custom Architects Network booth. BKLYN DESIGNS is Brooklyn’s premier design event showcasing a cross section of design, architecture and art. It was the first time that CRAN (the Custom Residential Architects Network), a committee of the American Institute of Architects, wase exhibiting at the event. Bostudio Architecture collaborated with other members of the CRAN committee on a booth that aims to explain the process of design and construction to potential homeowners. Ula Bochinska of Bostudio with colleague Kimberly Neuhaus of Neuhaus Design Architecture in front of the Brooklyn CRAN AIA booth. The Brooklyn CRAN AIA booth, assembled. The booth was designed, built and assembled through a collaboration of 17 architecture firms. Bostudio Architecture collaborates with Magdalena Keck Interior Design on the creation of Soho headquarters for leading tech industry company. 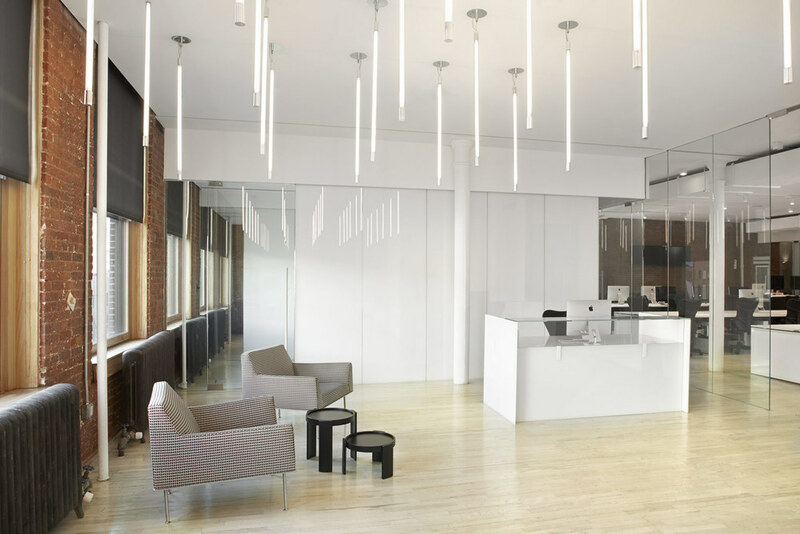 Located on West Broadway in the heart of New York City's Soho district, the brand new office build-out is spacious and bright. Contemporary elements like vast surfaces of glass and modern lighting are placed against the backdrop of existing brick walls and bleached maple floors. Please take a look at more pictures on our Web site and let us what you think! Bostudio has moved. We are two blocks from our previous location, at 200 6th Street, Ste 2A. Please feel free to stop by and visit! Who doesn’t get a shiver down their spine when hearing the word "cubicle"? It evokes images of depressing, windowless, colorless office spaces. (And, of course, the classic, spot-on movie Office Space.) The non-descript beige-gray shade of the tackboard fabric, the sad filing cabinets and overhead storage cabinets, the dated computers and fax machines. As dreadful as this aesthetic crime scene may be, cubicles were designed for a very specific purpose. Cubicles take up much less space than private offices, and yet provide a modicum of visual privacy and a well-defined private space for their occupants. The tackboards do more than provide wall space for attaching schedules, memos, and other important information; they serve an acoustical purpose, eliminating the echo effect by absorbing sound. I liken old-school cubicles to communism: good idea, terrible execution. Both lack beauty, personalization, and imagination. The open desk set-up, with no dividers, makes the office look cleaner, happier, and airier. However, this set-up does not work for every type of business. Semi-private workspaces that are modern, inviting, and inspiring are possible. Below are a few examples of how exciting a cubicle can be, which might just raise an eyebrow or two. A pretty simple set-up designed by Jones Haydu for Buck O’Neill Builders in San Francisco’s Potrero Hill neighborhood. The cubicles at the Vitra headquarters in Weil am Rhein, Germany, do not take up any more space than an open desk set-up. Additionally, the different colors of the interior lining allow for personalization. This privacy screen set-up at the desks in the Hybrid Office in Los Angeles, designed by Edward Ogosta Architecture, looks like a little village. You should not have any trouble directing a visitor to your workstation. How about your own workstation hut? Modelina office in Poznań Poland, via Archetizer. Speaking of personalization: consider the Typographic group of desks by Benoit Challand. Imagine all the different set-ups you could create. Each employee gets the desk representing the letter of his or her first name. Or the cubicles spell the company name and logo. Or assemble clusters of the same letters: D for design, E for engineering, S for support. There is no doubt that each employee requires proper tools to perform his work. However, creating a personalized, fun work environment is also high on the list of the virtues of an optimal office set-up. It’s doable, easy, and the possibilities are endless. Meet Me In The Pink Box or Conference Room 2.0. The conference room is a fixture in office design. Because it’s where deals are done and big ideas are generated, it often has the best seat in the house -- the largest windows and best view. But the space itself is often blah. There is plenty of opportunity, however, to make the conference room truly memorable and pleasurable by treating it as a freestanding, sculptural object. A well-designed conference room provides any company no better opportunity to make a spatial statement of intent and make people want to return for another meeting. The conference room of the Cape Town advertising firm 99c, designed by Inhouse Brand Architects is made out of a bold red shipping container, and has additional seating on top of the room. A meeting room at the Australian Red Cross Blood Service Processing Centre in Melbourne has a privacy screen consisting of blood types. A fun, circular room at CDS Offices in Tokyo, Japan, by Bakoko. The conference room of this SoHo office is made of paper tubes. Design by Magdalena Keck Interior Design, Bostudio Architecture acted as Architect of Record. Photo by Jeff Cate. A greenhouse acts as a flexible meeting space at DI Telegraph coworking space in Moscow, Russia. Design by Archiproba. An elegant simple cube with wood and glass at the offices for power company Nuon. Design by HEYLIGERS Design+Projects. An elaborate structure by Make Creative in Unit B4, a satellite office for the Australian property Group Goodman. Anne Sophie Goneau Design is not afraid to use a splash of color. A simple pink cube at the Tuango Tuango offices in Montreal, Canada. Embracing opportunities to create grand centerpieces is equally valid for dinner tables as it is for office spaces. It makes the place special and memorable. And a pleasure to be at work. Many years before today’s ubiquitous cool (to some), minimalist, equalizing open office space design , there was hierarchy. It was the summer of 1998 and I was an architectural intern for a firm that performed facilities management for a large corporation. We conducted surveys for office fittings on the weekends when the entire space was deserted. The first floor was a large showroom -- think IKEA meets a Hollywood soundstage. The second floor housed the company offices. It was my first (and perhaps last) visit of a typical American office fit-out: windowed private offices with heavy, extravagant wooden desks and credenzas, leather chairs and family portraits. The interior spaces, windowless and lacking personality, were fitted with modular cubicles, walls lined with tan fabric, used as tack board for schedules, restaurant menus and children’s artwork. Steel-Case filing cabinets of all shapes and sizes were scattered throughout. There was a definite hierarchy to the space, which did not mean I found the private offices any less depressing than the cubicles. The private offices resembled elaborately outfitted cells, the cubicles only modestly so. The class gap between executives and common workers was reminiscent of Medieval times, and seems even more dated in retrospect. In response to this nightmare of an office set-up a new way has emerged. Enter today’s open office scenario. 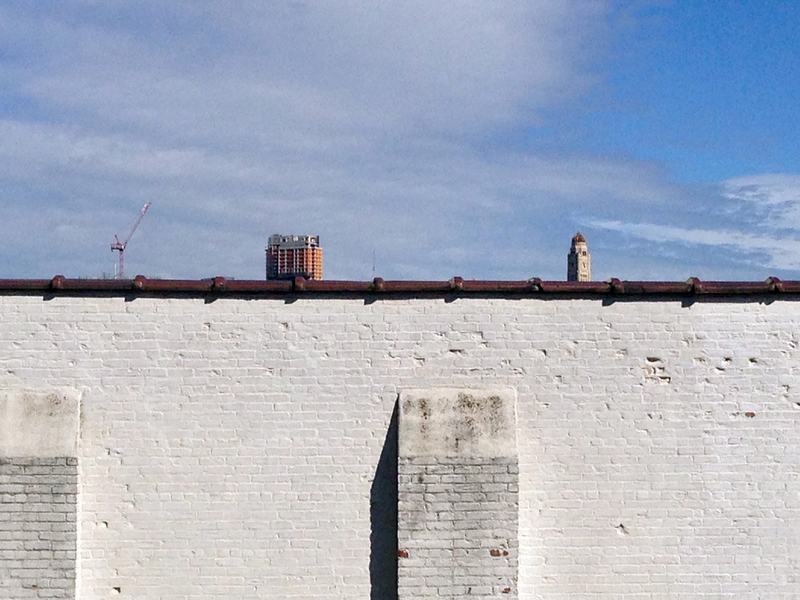 Goodbye, hierarchy – and good luck trying to figure out where the boss sits. An open office plan is believed to increase employee morale by allowing for collaboration and quick exchanges of ideas. It also saves space — a significantly larger amount of desks will fit into an open office than into the same square footage of private rooms. The sacrifice of having an open office is privacy, the opportunity for quiet, undisturbed work, and conversation. How do you isolate the employee from the very buzz employees generate? For the times when private conversation is required, or employees want to concentrate without being interrupted, a variety of enclosed rooms is typically provided. They vary in size from small “phone booths” for one to two people, to large board rooms with video conferencing capabilities. Many companies opt for the open office scenario, which understandably does not work for everybody. Employees of a non-profit law firm, Volunteers for Legal Service, which put together a survey in anticipation of relocating to a new space, were voicing strong opinions against an open office set-up. In their current office there noise complaints, both about phone conversation held in the open office and conversations flooding from the principals offices through open doors. This particular office was divided into several different teams to handle particular projects. In terms of office set-up, the employees opted for enclosed rooms, each seating members of a particular project team. Since the team members collaborate on a regular basis, but do not really interact with members of other teams, there is no need to share ideas between teams. Socializing will happen at the lunch break room and other common areas. The new office of real estate development company Sorgente Group of America is moving into a more traditional direction with key team members (director of finance, legal council, project manager) having separate offices. Support staff are located in an open office area in small work clusters. The private offices have tall glass doors creating a visual connection between office and open work space, while supplying natural light to the internally located open space. The entire staff has plenty opportunities to gather at the open pantry area, two lounges, meeting rooms and the outdoor roof terrace. Magdalena Keck Interior Design created on office design for tech start-up company 80/20. The desk of the three principals was situated at a 90-degree angle to staff desks, which retains a sense of hierarchy without creating a physical barrier between executives and staff. 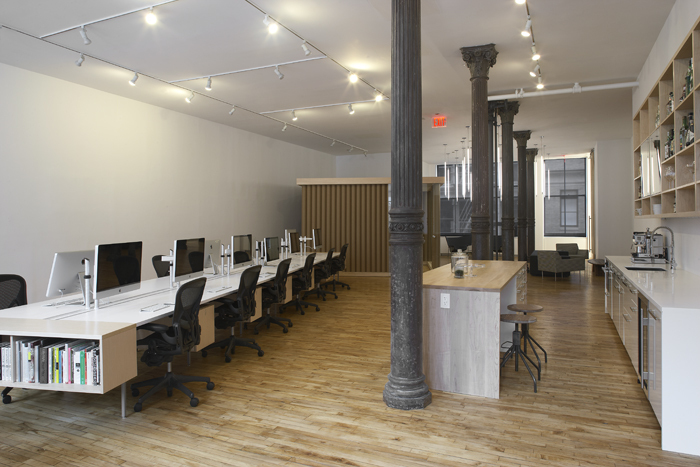 SoHo New York Office by Magdalena Keck Interior Design. Bostudio acted as Architect of Record. Photographs by Jeff Kate. The bottom line: an open office, despite its advantages, is not the solution for every firm. In the programming stage it is very important to identify the optimal office set-up based on how the firm operates. The choices are much more diverse and creative than simply a choice between traditional enclosed c-suite offices with windowless old-school cubicles, and a completely open office with no dividers and no spatially recognizable hierarchy. Also, the word “cubicle” has very much fallen out of favor. But imagine it redesigned to look modern, fresh and inviting? A workstation pod with collapsible or foldable partitions? Suddenly this option becomes viable again. Enter the cubicle renaissance. The first step to any office design should be a thorough survey to understand the ways the company operates, including feedback from staff and principals. After all, an office should fit perfectly as a bespoke, well-tailored suit, not plucked off the rack.